The Financial Year end is round the corner. Your employer may soon ask you to submit the investment proofs for the Financial Year 2018-19. If you are an employee of a company, at the beginning of every financial year (or) while joining the company you have to submit ‘Income Tax Declaration’ to your employer. This is a provisional statement that has details about your proposed investments and expenses that are Income Tax deductible. Based on your proposed investments and expenses, your employer deducts TDS (Tax Deduction at Source, if any) from your monthly salary and deposits it to the government account. To calculate TDS, your employer considers the declared investments and expenses that are either Tax Exempted (or) eligible for tax deductions under Income Tax Act. You need to submit both IT investment declaration and Investment proofs (documents) to your employer (IPSF – Investment Proof Submission Form). If you do not submit the required investment proofs at the year end, your employer will then be forced to deduct complete tax without considering your provisional investments (IT Declaration). The Income Tax Department has also issued a circular and made it very clear to all the employers to verify the genuineness of each claim made by the employee. So, the verification of investment proofs will be more stringent by the employers. Below are the document proofs that are generally accepted to claim income tax exemptions and allowances. Passbook copy of PPF (Public Provident Fund) or Copy of the stamped deposit receipt, paid during current financial year. Home loan statement from your banker or provider which reflects principal portion of your EMIs. Mutual Fund statement (Investments in ELSS funds or Retirement funds only, lump sum or SIPs). Kid’s tuition fee receipts. Kindly note that any payments made towards donation, uniform fee, van fee, maintenance fees etc., will not be considered. Copy of NSC certificate in the name of self. Copy of Tax saving Bank deposit receipt (5 year deposit). Copy of Post Office Term deposit receipt with more than 5 year term. Loan statement or interest certificate from your banker or home loan provider. You also have to submit completion certificate or occupancy certificate. Self-declaration whether the house is self-occupied or let-out one. HRA (House Rent Allowance) : Monthly rent receipts & rental agreement have to be submitted. The receipts should contain your landlord’s name, address and signature. If the annual rent paid is more than Rs 1 Lakh, landlord’s PAN should be quoted. In case, if you are paying the rent by cash, you have to affix revenue stamp on the receipts. Donations (Section 80G) : Receipts of donations are considered as proofs. Typically the receipt issued by the charitable organization you donate do mentions the eligibility under Section 80G. Kindly note that you may not be able to claim this deduction if your donation is made in cash and exceeds Rs 10,000. Education Loan (Section 80E) : Copy of loan certificate reflecting the interest payments. Medical Allowance : Do not get confused between your medical reimbursement allowance and mediclaim expenses. Medical allowance is provided by your employer. It is part of your employment agreement (salary structure) between your employer and yourself. To claim this allowance, you need to submit original medical bills with Doctor’s prescription(s) copies. The medical reimbursement allowance is exempted under Section 10 of the Income Tax Act. Medical Treatment on handicapped dependent (Section 80DD) : Copies of medical bills and duly completed Form 10-IA have to be submitted. Medical treatment expenses for the specified disease (Section 80DDB) : Medical Bills / expenditure incurred by way of medical treatment for a specified disease along with a certificate from a hospital in the prescribed form. (To claim Tax deductions under Section 80DDB, it is mandatory for an individual to obtain ‘Doctor Certificate’ or ‘Prescription’ from a specialist working in a Govt hospital only. This condition causes undue hardship to the persons intending to claim tax deduction. Now, CBDT (Central Board of Direct Taxes) has issued a notification relaxing this condition. Specialist Doctors working in Private hospitals also can issue a ‘certificate / prescription’ now). Download Form 10I. LTA (Leave Travel Allowance) : The bills (travel tickets) for your travel against LTA can only be claimed via your employer. LTA is allowed to be claimed twice in a block of four years. The current block is 2014 to 2018. You are allowed to carry forward your unclaimed LTA to the next year, so you can request your employer to not deduct tax on it and allow you to claim it next year. The last date to submit Investment proofs will be intimated to you by your employer. To safeguard the interest of the organization, your employer has the right to define the verification guidelines and more controls in addition to the income tax rules. Kindly note that there is no need to submit copies or originals of your investment proofs to the IT department. It is advisable to keep copies of all your original documents for your future reference. If you join a new company during the middle of the Financial Year, do inform them about your previous income details and also submit fresh Income Tax declaration. If your SIP or life insurance premium due date is say in the month of March and the last date to submit investment proofs is say in January, you can provide a declaration that you are going to make these investments in March. You can also submit previous year’s documents that are related to these investments. In case, if your declared investment amount is more than your actual investments, you have to pay additional taxes while filing your Income Tax Return (or) your company may re-calculate your tax liability and can deduct taxes accordingly for the months of January to March. If you are falling short of your projected declared amount, you can plan your investments in the next 3 months or so. It is prudent to avoid last minute tax planning. Do not invest in unwanted life insurance polices or in any other financial products just to save taxes. It is better you plan your taxes based on your financial goals at the beginning of the Financial Year itself. Tax Saving investment options u/s 80c : In whose name can they be invested? Do You have any idea of ‘absli multiplier fund’ ? How much beneficial it is to open this plan. Dear Sushmita ..Kindly refer to our conversation @ FB. You can give up to Jan month and can show the investments made in feb/mar for tax deduction while filing your income tax return.. While doing the Investment proof submission, is it necessary to submit Form 12BB as well? Or just the Investment proofs are enough? Kindly check the internal procedure followed by your Employer..
What if someone’s takehome is 30,000 including incentives of INR 3000 and how much tax would be deducted? You may kindly use this online calculator and check for yourself..
Two years ago I missed updating my previous company salary due to job change during the middle of the year, I received notification from IT that I have to pay the pending amount of 50K but I am not sure how to pay them to clear this out. I have gone to my login and checked the redressal option but still nothing so far, how to solve this. Please let me know if there is a way. Kindly check the ‘outstanding dues’ link in your efiling account. e-File -> Response to Outstanding Tax Demand. You may also take help of a Chartered Accountant in this regard. How to pay Outstanding Income Tax Demand online? Hi Srikanth, I have declared 1L NSC in IT declaration , but some reasons I haven’t taken it for this year…so, my question here is can I submit MF as tax proofs (which was not included at the time of declaration) along with LIC, Kids tution fee to cover 1.5 L cap under 80C??? Appreciate your quick response. Yes, you can include the mentioned investments for tax saving now or while filing your Income Tax Return. I AM OLD READER. I WANT TO KNOW THAT I INVESTED ONE TIME LIC SAMRIDHI PLUS SINGLE PREMIUM UNIT PLAN WHICH GIVE DEDUCTION U/S 80 C DURING YEAR 2011 OF RS.100000/- THIS IS TEN YEAR POLICY. NOW I REDEEM MY SAID POLICY DURING SEP.2018. NOW MY QUESTION IS THAT I WAS PAID RS.194369/- ON LIC SAMRIDHI PLUS POLICY & TRANSFERED RS.194369/- INTO MY A/C THROUGH RTGS OF UNIT PRICE. WHOLE AMOUNT IS SHOWING IN TO MY 26AS FORM OF INCOME TAX i.e.RS.194369/-INVESTED AMOUNT PLUS APPRICIATION PRICE OF UNIT. MY NOTIONAL GAIN IS RS.94369/- BUT LIC SHOWING FULL AMOUNT TRANSFERED INTO MY A/C. SIR, IN WHICH ACT OF INCOME TAX I CLAIM DEDUCTION. OR I SHALL TAKE FULL AMOUNT INCOME FROM OTHER SOURCES FULL AMOUNT / GAIN ONLY. BUT TOTAL INCOME CRDITED SHOWN IN 26AS FORM OF INCOME TAX.I VISITED BRANCH THEY GAVE ME CERTIFICATE OF INVESTMENT PLUS GAIN ON IT. KINDLY ADVICE ME AT THE EARLIEST. They will show the entire maturity payment as total income received in Form 26AS. Did you see any TDS amount being deducted for this entry? In case, TDS is deducted, then you need to show the entire amount as your income in ITR and file your taxes accordingly after considering the TDS amount. I OPENED THE INCOME TAX SITE & SEE MY 26AS STATEMENT FOR THE FINANCIAL YEAR 2018-19 WHERE 1% TDS SHOWN IN RESPECT OF TOTAL INCOME CTEDITED BY LIC. 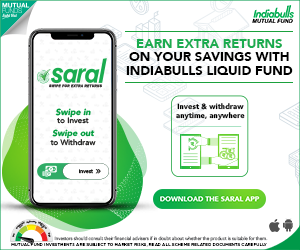 I BROUGHT/ PURCHASED LIC SAMRIDHI PLUD ON MAY 2011 FOR RS.100000/-& MATURITY OF SAMARDHI PLUS ON SEP 2018 RS.193339/- INTO MY SB A/C & TDS Rs. 1934/-SHOWN IN 26AS STATEMENT NOT THE INTIMATED TO ME BY LIC. IT WAS KNOWN TO ME BY OPENING THE ONCOME TAX SITE & SEE MY 26AS DTSTEMENT. YOUR COMMENTS ARE FOR REGULAR POLICY. I PURCHASED LIC SAMRIDHI PLUS SINGLE PREMIUM FOR RS.100000/- ON MAY 2011,LIFE COVER WAS RS.1,25,000/- i.e.1.25% OF SINGLE PREMIUM POLICY.AND RETAINED THE POLICY 7 YEAR & SIX MONTHS . I REPURCHASED THE LIC SAMRIDHI PLUS DURING MONTH OCT.2018,WITH NAV VALUE RS.1,93,339/- YOU ARE REQUESTED TO GIVE CLEAR QUARRY FOR SINGLE PREMIUM & INSURANCE COVE 1.25% OF PREMIUM AMOUNT. KINDLY REPEAT THE REPLY FOR SINGLE PREMIUM POLICY i.e. ONE TIME PAYMENT. The previous comment stands good for the above query as well. “If the premium is more than 10% of the sum assured, any money received from a life insurance policy is fully taxable. It is usually the single premium policy which fall in this trap, since premiums are high. Check if the premium paid by you is more than 10% of the sum assured. If that is true the amount received is fully taxable. This is true for all life insurance policies purchased after 1st April 2012. For policies purchased between 1st April 2003 & 31st March 2012, the insurance premium you pay in a year should be less than or equal to 20% of the Sum Assured in the plan. If this condition is not met, the entire maturity proceeds will be taxable income in the year that the policy matures. Starting October 2014, if the amount received from a policy is more than Rs 1,00,000 and it is taxable, TDS @ 2% shall be deducted by the insurer before making this payment. Kindly contact your employer (HR/Finance team) and get it rectified, its an internal procedure and can be updated. Dear Saravanan..You may kindly contact your employer (HR/Fin team). What all investment proofs need to be self signed? Dear Garg..It depends on your employer/company’s policies and procedures. Kindly check with them. Is we are eligible to declare personal loan under 80C ? The principal amount repaid on the personal loan cannot be claimed as deduction under Section 80C of Income-Tax Act. Hi actually I forgot to do IT declaration for the year 2018-19….due to which my company deducted tax from April salary.I am going to declare by May 2018 ,,so will I get back the amount of money which I have loose dis month and if yes when will I get back the money. Your employer has deducted TDS. But your actual tax liability can be ascertained when you file your taxes for AY 2019-20. I watched your blog to be especially illuminating. I am fundamentally excited by your posts and considering molding mine now. A dedication of thankfulness is all together to be an inspiration to me as I was other than attempting to make makes however was not getting the fitting class. Unless and until you redeem the MF units, there is no need to disclose the unrealized income/ gain in your ITR. Which ITR form to file? Thanks for the article as its really helpful. Here I committed a lame mistake & missed the last day to submit the Investment declaration for 2017 – 2018 . Is there any way possible that such declaration can be done independently in such scenarios? Is it Assessment year 2017-18 or FY 2017-18? Is there any time limit for making investments for claiming deduction u/s 80C. My PPF cheque got cleared only in April first week…can i clain it for this FY? If it is cleared in April 2017, you can claim tax deduction for FY 2017-18 / AY 2018-19. This is indeed very helpful. I wish i had read this sooner. My employers have deducted income tax from my February and March ’17 salaries, as I missed the date to submit the investment proofs. I only had medical insurance as proof and had submitted it last month (showed med insurance for last financial year too; my salary has been the same since) and I was wondering if it’s possible to file for a refund. Would really appreciate your help on this. If your employer has not considered the proof, you can claim the premium paid u/s 80D in your ITR and claim Refund (if any). Thanks for the reply. I will file for a refund. For the future, is there a way to know how much investment we have to show as proof according to one’s CTC? Suggest you to plan your expenses/investments based on your financial goals rather than just to save taxes, that can be a right approach! Read : Think beyond taxes when investing! You may visit this link, use the available calculator, and you can key in your salary details & investments to know your tax liability. Read: List of important Income Tax exemptions for FY 2017-18 / AY 2018-19. Will do. Thank you so much for your help, Sreekanth! I am a Non-Resident Indian, having an income of INR 300,000 to 350,000 (approx) per annum thru Cooperative bank FDs. Do I need to file ITR? if so, where can I find the details and which are the forms to be used? Thanks in advance. Yes, you may have to file your ITR. The new ITR forms for AY 2017-18 are yet to be released by the IT dept. Do I need to file ITR? Which ITR forms to file? Thank you for your swift reply Mr. Reddy garu. I understand that I need to use New ITR-1 (Sahaj) for my ITR filing. By the way, my banker has deducted TDS from my FDs and from NRO Savings Account for FY 2016-2017 and I have not yet received the TDS certificate. Usually, How long will take to get it and when is the last date for filing my ITR. Dear Raghu ..As of now, last date to file AY 2017-18 ITR is 31st July, 2017. You can find TDS details in your Form 26AS too..
Further to above, there were few TDS deductions from SB NRO and FD interests by ICICI and Canara Banks. Only one deduction details is shown on Form 26AS where as total four (4) deductions as per my bank statement. Appreciate if you can guide to get all details regarding this. Dear Raghu ..Kindly check with your bank. 15 May 2017 is the due date for issue of TDS Certificate for tax deducted under section 194-IA​ in the month of March, 2017. If your previous employer has already accounted for it and calculated your TDS/tax liability (if any), then it should be of any issue. It has not been accounted by my previous employer can I declare that HRA at time of efiling? Yes, you can claim HRA (if unaccounted) while filing your Income Tax Return. Hi, can you help me whether i have to submit the investment proof? because this is my first time and I joined the company in the month of November16 and my annual CTC is 3.5lac. Kindly help me. i totally confused what to do. If your income is above basic exemption limit ie Rs 2.5 lakh, then you may have tax liability. In case, you made or planning to make any investments for tax saving purposes, you can submit them as investments proofs to your employer. Can infertility treatment & medicine bills be submitted as a part of Medical Reimbursement? Is Medical allowance as part of your Salary structure? Kindly read: Section 80D & Medical allowance. Thank You! I am referring to Medical Allowance Reimbursement(Sec 10) provided by the employer as a part of the salary structure. Just wanted to know if infertility treatment and medicine bills can be claimed under this category.. I believe you can claim..kindly go through the suggested article. Thanks a lot Mr.Sreekanth. In case if employees do not wish to provide medical bills for Medical reimbursement, can that 15000/- be considered as fully taxable component? I wanted to Know , am i supposed to fill these forms or not for FY-2016-2017, as I have joined my company in October 2016, only..and the investment declaration is taking the period from April 2016-march 2017.??? and if yes, do i need to submit rent receipt from march 2016 onward or from october 2016? You can declare your previous salary , TDS & investment details to your new employer. They will then accordingly calculate TDS (if any) and issue Form 16 after current FY ends. I am a fresher and this is my first job. Oh ok. You have to submit investment proofs to your employer that will help them to calculate your TDS and deposit taxes (if any) to the Govt. If you can not submit, you can claim them when you file your ITR (if you have taxable income). Very useful info on tax planning. I am a salaried person and my housing loan deductions are from my salary account. but due to some personal reason, I have not declared my housing loan to employer. Accordingly, not submitted Home loan interest deduction certificate to them. However, at the time of e-filling, i want to declare all the deductions (Interest – 2 lakhs) to claim the benefit. Dear Raj..There wont be any issues. I wanted to know one thing, can we claimed our own education/Tution fee for TDS? Kindly note that Deduction is not available towards payment made for tuition fees of Self, spouse, brother or sister, father or mother or any other relative – u/s 80c. I have invested Rs.30000 towards ULIP through a private bank in the beginning of January. I have submitted it for investment proof submission to my employer with payment receipt. During the televerification from bank, i came to know complete details about the plan which were hidden by the agent. So i had decided to back off and request for cancel and refund. My request was processed and got refund of Rs.30000 two days back. When i went to undo the Rs.30000 which i had declared on employer’s payroll site, It is now showing verified and i am unable to modify it on Payroll site of my employer. The agent is threatening me that this will be tax evasion issue and forcing me to opt the plan but i am not at all willing to take that plan. How to overcome this situation? If i invest this 30000 in any other place say PPF or FD and show it during ITR filing, will this be a solution to compensate? Kindly suggest how to procees sir. There is absolutely no issue with your case. If you are not convinced with the said plan, kindly do not renew it again. Firstly, check with your HR or Finance team, if it is possible to remove that entry w.r.t investment declaration. If that is not possible, and your employer considers it for TDS calculation (Form 16), still there is no issue. You can file your income tax return without considering this Rs 30k and pay necessary taxes. In case if you wish to invest this in some other tax saving option like ELSS fund or 5 year tax saving FD u/s 80c, you may do so before March 2017. Pls let me know the maximum amount of education fees for single child for Income Tax deduction for FY 2016-17. Also maximum PPF amount permissible as deduction. Tuition fee & PPF , can be claimed under section 80c, the maximum allowable limit under this section is Rs 1.5 Lakh. Dear khajavali ..No you can not claim the said deposit amount as tax deduction. How Much investment i can show including HRA for income Tax saving. I have declared 100000 rs in IT DECLARATION mutual fund.But at the time i have proof for 50000 rs . I want to know that in FORM 12BB i have to mention 1,00,000 or 50,000. Because rest of the the proofs are available till march 2017. Kindly solve my problem ASAP. You can declare Rs 50k in Form 12bb, in case your employer insists on actual proofs. The remaining amount you can declare when filing your income tax return. Hello Mr. Sreekanth, Please clarify if Play School fees can be considered for Tax exemption. Please note the receipt doesnt classify as tution fees but just says Term fees. Deduction is available towards tuition fee for any full-time education courses that includes Nursery School, Creches & play schools. Thank You Mr.Sreekanth! I hope for all Insurances, only the premium amount can be claimed. Pls clarify. Dear Sindhuja ..Yes, w.r.t. life & health insurance related premiums. How an employee will submit proof of evidence on january if that employee plan to invest after January of the said financial year. In that case what is the role of employer? I am submitting the rent recipts and PAN card of my mother as landlady for Rs. 20000 pm, but actually i am not giving. Is this correct or should i transfer this amount into her account and take back for my use. Dear Vikas ..Obviously this is wrong and not ethical, I am sure you agree with me. one doubt for NPS total 50000 i need to invest and will be invested in next 2 months and currently company asking proof what type proof is sufficient for this declaration. NPS Contributions (Section 80CCD) : Copy of the stamped deposit receipt, paid during current financial year and copy of the Passbook with clear mention as NPS (National Pension System) Account. I am living in a rented house at hyderabad and a salaried person. I am paying house rent to the landlord by online transaction. Can I avail income tax benefit by showing only account statement to the employer as landlord is not giving the pan card and the receipts of house rent. An early reply would be helpful. Your employer may not accept bank statement as proof of rent paid. I’ve joined new organization on 20th Dec-2016. I had already declared IT savings for FY15-16 in my previous employer and submitted respective proofs on the same. Could you let me know if I still need to declare and submit IT proofs for FY15-16 in new organization? You can declare the income earned from your previous employment, TDS & investments details to your current employer. And also, can inform them about the investments for next quarter, so that they can calculate your tax liability / TDS accordingly. Thanks for the details. Wanted to know where can I get pre-emi paid certificate? I checked in my bank – they provided Home Loan Int.Cert (Prov). I need the data/proof to show my employer that I had paid pre-EMI before possession of flat. Dear Priya..You can get it from your banker/lending insti. I checked with bank and they mentioned that “There is no such certificate/document which is about pre-EMI”. Bank guys asked me to refer Home Loan Int.Cert (Prov) doc. Can I show Home Loan Int.Cert (Prov) to claim my pre-EMI? Yes, you may do so. You can get the Home loan statement for the relevant period and claim tax benefits. Dear mohank..I believe you can do so, kindly check with your employer too. If the landlord is an NRI and does not have a PAN Card, can we submit a declaration document in cases where the rent amount is greater than INR100,000? Dear Ganesh..I believe it is acceptable, the declaration has to be given by the landlord. The declaration is signed by the landlord. If I submit the same declaration as part of my Investment proofs, will it be sufficient? I was a freelancer. I joined a full time job in september 2016. Now, I need to submit form 12b. How can I provide previous employer PAN or TAN details? Kindly contact your ex-employer and get the details. You can also ask for Form 16A if TDS has been deducted. I left fulltime job in April, 2013. Since last 3 years, I am a freelancer and I have multiple clients. How can I fill for 12B? Dear Avinash ..You have to submit details pertaining to this FY only. I am working at MNC. I could not declare any tax for 2016-2017, I want to know much they gonna deduct in my salary? when they gonna deduct? is there a way to apply now? For AY 2016-17? You can still file a belated return. Kindly visit IT dept e-filing portal and e-file your returns. I am working as a freelancer (working for UK based software company). So I don’t get any pay slips or form 16. Please let me know the process to pay tax and suggestions for investments to reduce tax amount. Dear Krishna ..May I know your Residential Status? If you are Resident Indian then you can file ITR 4 form. List of income tax deductions. Yes, I am resident indian (Hyderabad). What is the difference between ITR 4 and ITR 4 (SUGAM) forms ? My Income is around 12 lakhs per annum. Dear Krishna..I believe freelancer cant file tax returns in ITR 4s. Read: Different types of ITR forms.. I have worked April’16 to July’ 16 to my first employer and submitted my Investment Declaration for IT for full year in April’ 16. Now my first employer is not considering the Investment Declaration for IT and calculating TDS on the basis of no Investment for IT. I believe they should considered the Investment Declaration for IT on the proportionate basis of 4 months. Kindly guide me whether I am right or wrong. If I am right than kindly inform me the relevant section/notification, etc. Waiting for your valuable suggestion and guidance. Even if they do not consider it, you can claim the TDS (if any) when filing your income tax return for AY 2017-18. Do inform your new employer about the total income earned form your ex-employer. My husband is doing small own business (in Furniture Field) He is not claim any tax exemption. I am working in Limited company, Now the TDS (Rs. 1500/-) is deducting in my salary. I already discussed in the post office to change the name of depositor from my husbands to me. But they told it is not possible. actually I am paying the every month the amt of 2500/- SSA. And also I have to pay this amt 14 Years long period. Kindly suggest me how I overcome from this problem. Dear Parvati..I believe that Guardian name can be changed. Change Bank details to Post office from which The same SSA is deducting & give Bank details of Your Husband & Show Husband Investment In Your Husband Income Tax Return. If You are paying Cash then show that Husband Investment in Income Tax Return. I have taken LIC policy in Jan 2016 and paid in single amount for whole year i.e. Jan-Dec 2016. Can I show this as an investment proof for FY 2016-17 in my company for tax declaration? For the premium paid in Jan 2016, you can claim the tax deduction for Assessment Year 2016-17. But I want to show for AY 2017-18. So cnt i show premium paid in Jan 16? I got that point. But my main concern is the amount i have paid in Jan 2016 for 12 months, I cnt show it for AY 2017-18? As I understand, the TDS is deducted based on the investment declaration that is made beforehand. As per my current employer, they are saying that they will only consider 50% of my investment declaration for my salary disbursement right now and once I submit the proofs, 100% amount will be considered. Please let me know whether this is right as per rules and can be done by employers because this was not the case with my earlier organisation. The employers can frame their own rules as part of their compliance check. Thanks for the well explained article on Income Tax. I have invested Rs 1 Lac on HDFC Life Growth Plus plan in December 2015 and I had submitted all the investment proofs to my Employer before March 2015. But my investment was not reflected in my Form 16 as a result of which, a huge amount of additional tax was deducted from my salary. 1) From your article, I read that the additional deducted tax amount can be claimed and there is no need to submit the investment proofs. But my concern is, since my Form 16 does not reflect the investment, wouldn’t the IT dept compare my Form 16 with the IT returns that I have filed. 2) How will the IT dept know if the refund claimed is genuine or not? 3) Is there are any means to attach the investment proofs while filing my IT Returns? Request you to help me with appropriate answers as soon as possible. 1 – Kindly note that the IT dept do not have access to your Form 16. If you have paid the premium, you can surely claim tax deduction when filing your income tax return and can get the REFUND of extra taxes paid, if any. 2 – That’s why it is referred to as SELF-ASSESSMENT. If they find any discrepancies, they will issue compliance notice. Solved? I had the same issue? If the person is not working , he has few FD’s on which he gets interest , which is below tax slab (2,50,000. If he files ITR mentioning that interest amount in income from other source. Ex: IF he has got interests from FD’s around 1,00,000rs and some hand cash of 60,000rs. if he metions 1,60000 in that coloumn and files ITR. 2. MY mother is retired Bank employee, she is getting pension 70k yearly and few fixed deposits continued from long years. My question should she require to mention all fd’s interest (runing and closed )exactly to paisa , she comes below tax slab. Once itr filed , does income tax ask proofs for exact interest of some closedfds. Pension income is taxable and interest income on FDs/RDs is taxable. Generally the interest income has to be shown in ITR as and when it is accrued. Kindly read: FD/RD & income tax implications. Filing of taxes is known as SELF-ASSESSMENT. You are assessing your income, expenses & investments and then filing your tax return. The onus of justifiying your assessment rests with you if in case the Tax dept or Assessing officer sends you a tax notice or compliance notice. 1. My Dad is central govt employee, as per him he had file the ITR for 2013-14 and 2014-15, but though we have recieved the intimation from IT dept to file. Now prob is we dont have form 16. How can we file now. 2. Dad is Retired now and pension is being released, his Yearly pension is 4.12L. He got retired feb-2015, so from Feb to this year 2016 march there was not Tax detucted. But now from April 2016 the projected TAX is 82,000.00. We are not sure how this has been calculated. Now every month 6-7K deductions happening. I will be grateful to you for your your help. 1 – You may file the Returns based on Form 26AS and other documents like Bank statements. 2 – Have you provided PAN details to your banker? If PAN is not available with the bank, they can deduct TDS @ 20%. Kindly check this out. He can file ITR and get the TDS as REFUND (if any). For the previous year 15-16, I submitted some medical bills until Jan to my employer. For Feb and Mar they do not accept any proofs. Now I have some original medical bills/doctor prescriptions from Feb and Mar. Can I add this amount under medical exemption (section 17) when filing IT returns? If so, should hard copy of these bills be submitted to IT ? Please clarify. Even if you miss the deadline for submitting the investment proofs, you can still claim all the tax deductions “except few allowances like LTA or Medical allowance” while filing your Income Tax Return. So, you can’t claim the said allowance now. I am working in government organization, Govt. of Gujarat as an engineer. I have three Life Insurance policies and regularly paid to Life India Corporation(INDIA) by myself at the once in October month of the every year. Continuous to this, my policy has been started from Oct-2012 and shall be continued to upcoming 20 years. Since year of 2012, I have taken total amount of these policies as an exemption under 80(C) in the Income Tax at every financial year. 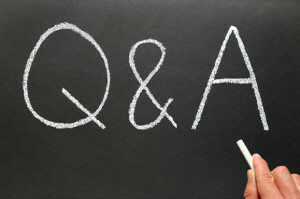 Now, my question is…….. I had already taken exemption in the Income Tax under 80 (C) of these policies paid amount in the financial year 2015-16 which was paid in the month of October – 2015 and same was submitted to our organization account section for consider as a provisional saving for the next Financial year 2016-17. So, no deduction tax on my monthly salary income but they are not taken paid previous year policies receipt as a provisional because I have no paid policies receipt of the month of October 2016 (i.e. Financial year 2016-17). I am not agree with this point so asking to you please guide in the matter. I hope your reply comments shall be helpful to me for no deduction tax amount in my monthly salary income. Generally employers do accept previous receipts as documentary evidence that you are going to pay them in this FY also. If your employer is not accepting old receipts then nothing else we can do than to follow their policies & guidelines. You may submit the proofs after paying the premiums. In case if they deduct any TDS, you can reclaim it when filing Income Tax return. Read: Form 12BB for claiming income tax exemptions. Hi Sreekanth, During this year I donated an amount to one of Old Age Home. While filing the tax online- I was able to enter the details of the same in 80G tab @ incometaxindiaefiling.gov.in. Can you help me understand – when/how should I be submitting the hardcopy of the receipts that I had received from Old Age Home. You need not submit the receipts or any other proof for your donations along with your IT return. Okay. Thank you.. But Is this the case for every declarations we do . What I mean is For 80C, 80D and others @ my company they take the soft copy documents and for HRA they collect the hardcopy documents. So since this is 80G – are we not supposed to upload any proofs anywhere or Is this the case for every thing that we declare EXTRA ( other than what is NOT THERE in FORM16 ) at the incometax website. You may have to submit proofs to your employer but there is no requirement to submit the same to the ITD when filing your returns. HI bro i have clicked the link but i do not know where i should enter the details in respective tabs, can you check for me , my take home is 42000, I have house rent for 12000, Medical expense for 10000 monthly, so with these information can you let me know whether this is enough or i should decalre more. My CTC is 5.6. can you help me in this as the last date to decalre is 15 of this month. Based on my salary IT for upcoming month is 8k. I have submitted documents for 22k. Is that enough to compensate the 8k income tax, or even after this i will have to pay income tax. (I have Rent slips, Medical expenses and LIC policy). Can you help me in this????? Dear Harsshan..Kindly calculate your expected tax liability with this tax calculator..click here..
Dear Anshad..I believe that only your wife can claim tax benefits. So, suggest you to get your name updated as ‘guardian’. I want to file ITR online by myself for last 4 years [assessment year 15-16(cur), 14-15, 13-14, 12-13, 11-12. 1> Can i do it by myself, is there any problem in doing so? NOTE: Let me tell you that i have not yet been able to file any return but got TDS certificates from my employers for the above periods. 2>How to proceed online and what documents to upload online? 3>Can i also claim any returns from earlier year, if not then can i simply file it to get a ‘return file’ from my side for the last 4 years as a proof of ITR ? Suggest you to kindly get the Returns done through a Chartered Accountant. On 31.03.2016, I invested Rs. 50,000 in my NPS Tier-I account. My saving account was debited on 31.03.2016 and a statement of successful transaction dated 31.03.2016 got generated. However, when I checked my Tier-I holding statement of FY 2015-16, I did not find the mention of Rs. 50,000/- which I had invested on 31.03.2016. In fact, this investment is being reflected in holding statement of FY 2016-17 which shows that units have been allotted on 05.04.2016. In view of above, please clarify whether my investment of Rs. 50,000/- done on 31.03.2016 shall be considered for deduction in FY 2015-16 or FY 2016-17. Tricky one. I believe that the date of units allotment is considered (but I am not 100% sure on this). My employer is insisting on submissions of Investment proofs on a monthly basis so that income tax is deducted after taking into account the estimated gross income . For eg, if my estimated gross salary is 7 lakhs and I have not shown any investment proofs in the month of april, then my IT deducted from my april salary is Rs 5417, (25000 + 20000/12). I would like to know if this is the correct procedure or is there any circular by the IT dept regarding the procedure of deduction of IT from salary from the employer. Dear pranav..The employer can lay down certain rules as per their HR policies and nothing wrong in that. I’m a freelancer. I have no employer to submit the Investment Proofs. So, when I’m paying tax as a freelance individual, to whom should I give the investment proof? or Is it okay If I keep myself and didn’t give to anybody? There is no need to submit or enclose your investment proofs along with your Income Tax Return. You have to keep it yourself and in-case if there are notices/scrutiny orders given to you by the IT dept, these can be useful to justify your filings. Can you give me the CBDT cIRCULAR regarding the investment paid u/s 80C , but not claimed in the return and the Circular States that it is the duty of the A.O. to give effect to the investment actually made which qualifies u/s 80c by resorting to section 154 or so ………Kindly provide the circular as I could not search the same…Thanks…. Hi Sreekanth, seeking your help on the matter – I am currently abroad for a year. Not an NRI as I shifted in December 2015. I filed return (before 31 Dec 2015) through a CA firm & sent the duly signed form as well. I had not yet exhausted the 80C limit. On 30 March 2016, i put some amount in ppf. Since this amount was not claimed while filing return, can i claim a refund? Please help! this article is very use full..
also if i plan to take FD in march can i include in declaration? Dear shravanan..If it is a 5 year tax saving FD. Why you should avoid investing in FDs/RDs for long-term? Tax Treatment of various Financial instruments. EPF contributions made by your employer should not be part of 80c deductions. thank for ur reply..i will check these things.. If a person failed to submit the investment declaration to the employer, subsequently high amount tax had been debited from his salary. is it possible to claim return by noting the actual investments by the time of filing? The actual impact of giving investment declaration is to get avoid TDS deduction. Right? Is it mandatory to declare investment details to employer if the employee is working in a Public Sector Bank? 2 – Is to try to calculate the right tax liability & TDS (if any). 3 – No. But its a prudent thing to declare your proofs and pay taxes (if any) accordingly. Thanks for such a useful information. Can you further guide that what supporting should be provided by an employee to furnish with his employer in relation to benefit u/s 80CCD(1B) for additional benefit beyond 1.50 lakh, from where it must be clear whether the benefit relates to section 80CCD(1B) or 80CCD(1) ? In short, how to justify the right benefit towards Additional 50000/- ? If your Section 80c+cce+ccd(1) is full with Rs 1.5 Lakh, then you can just submit the print out of the NPS Transaction Statement which could be used as a document for claiming tax benefit. I want to know what supporting can be provided by employee to his employer as proof of investment to substantiate the claim of additional benefit of Rs. 50,000/- as per section 80CCD(1B) ? Dear Somnath..As mentioned in my previous comment, you can submit NPS Transaction Statement as an investment proof. I have purchased a flat in Navi Mumbai in Feb ’15 and paid stamp duty and registration charges for it in the same month. However, I did not claim the deduction of theses charges under Section 80C last year. Can I claim deductions for the same in current financial year, although I had paid these charges in last financial year. Dear Chetan..No you can not claim them now. Thanks. So can I claim returns on this charges on tax paid last year, as I had not exhausted limit of Rs. 150000 for Section 80 C last year . Nice article. got very cleared of investment concept…..much much thank you for sharing this article with us. I am doing LLB and paid fee of 45000 while on the job. Can i claim this while giving the investment proof this year. Dear Vikrant..What type of fee is it? The tax slab rates are same for physically handicapped individuals too. Under Section 80U a deduction in respect of a person with disability can claim up to Rs 75,000 and for person with severe disability can claim Rs 1.25 Lakh for medical treatment. For availing deduction u/s. 80U, the assessee needs to fulfill certain legal formalities like he has to obtain a certificate from medical authority constituted by either the Central or the State Government, along with the Return of Income for the year for which the deduction is claimed. Dear friend, i greet you and i bring you good business proposal. Actually, I am Mrs. Ayishah Azaan by name and i want us to partner. I discovered a fund in a dormant account under my custody as a Banker, i want you to collaborate with me to move the fund for investment purpose instead of it being confiscated by the government. I will give you all the necessary legal documents that makes you the new beneficiary. All that is required of you is your co-operation and acceptance to partner with me. Also i shall give you 20% as soon as you receive the fund. No risk is involve as the documents will be authentic and originals. I wait for your mail now. You can consider investing in ELSS Mutual fund schemes for long-term goals + tax savings purposes. Medical Health Insurance & Income Tax Benefits u/s 80D. List of Tax deductions for AY 2016-17. I have switched my organisation in Aug-15 & my previous organisation has given me the Form 16 of FY14-15. At my current organisation, I have been asked to submit my previous organisation Form 16. So is the FY 14-15 form only needs to be submitted or there will be another Form for FY 15-16. Also my current organisation need Form 12B, which I don’t have. How can I do it now?? Generally form 16s are issued after the financial year. Your current employer would like to add your income from previous employment and calculate the TDS (tax liability) accordingly. Form 12B can be completed and submitted by yourself. It is required to be furnished if any employee joins the organization in the middle of the year. Kindly click here to download Form 12b. I want to know whether I can file refund for previous financial year, I already filed the tax return for last year but i did not show all the investments so is there a way to file refund for last year? You can revise your return if your earlier ITR is not yet processed. As per section 139(5) of the Income-tax Act, 1961, the revised return can be filed before the expiry of one year from the end of the relevant assessment year or before the completion of assessment by the income tax department, whichever is earlier. So, for instance, if you have already filed your return for financial year 2013-14 (FY14) before the due date, 31 July 2014, but want to make modifications, you can file a revised return till 31 March 2016. However, if the income tax department has already completed the assessment of your return, then you cannot file a revised return. Thank you sir ! so how will i know if it is processed or not? Dear Sujan..Have you e-filied your ITR? (online), if so you can visit incometaxindiaefiling.gov.in and check your ITR status. every year I am declaring my investment under 80C (PPF). and I’ve to deposite declared amount in PPF account by end of December because my company collecting all supporting at end of December. What if I depositing amount in January to March period? am I still applicable for tax saving for January to March amount? how to claim it? If you are unable to invest in a tax saving product before the IT proofs submission date with your employer, you can invest the amount in jan/feb/mar and claim this deduction while filing your Income Tax Return for Assessment Year 2016-17. In case, if your company has deducted a higher TDS, you can get the refund accordingly. If you have incurred tuition fee for your own study then that will not be qualified for tax deduction under section 80c, as this clause is available for the payment towards ones kid’s education only. Thank for such an informative article. i have a query regatding PPI adjustment on home loan. 1. do we need to attach provisional certificates for prior financial years as well while submitting to employer? 2. i got possasion of my pune flat within 3 years and i am residing in mumbai on rent.so how can i save maximum tax on loan interest for Prior years as well as current year. please note i am claiming HRA as well. 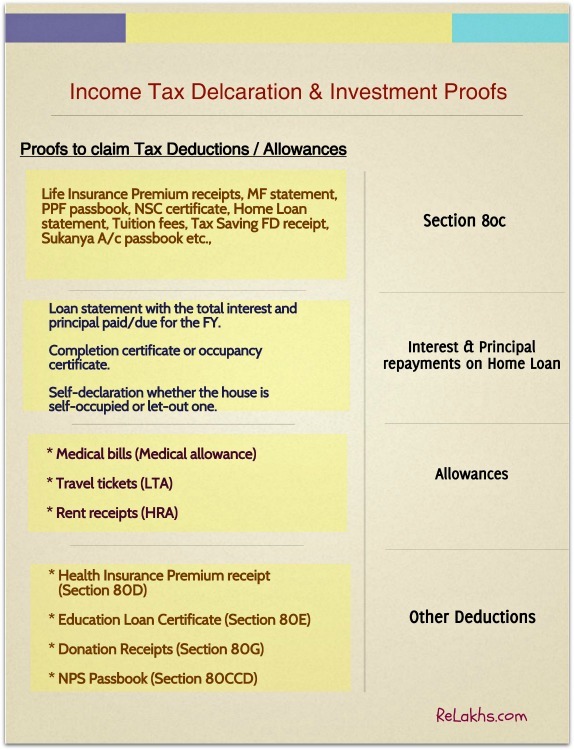 2 – Yes you can claim HRA plus tax benefits on your home loan. Total interest payments in this FY can be claimed (u/s 24) along with principal repayments u/s 80c. You can claim prior period (under construction period) interest amount (if any). Read : Under Construction Property & Home loan tax benefits. Income from house property & Tax implicaitons. thank you sreekanth. I have a query so how am I going to combine current FY interest and previous FY interest and, how my employer going to believe with out prior FY home loan repayment statement, isn’t he going to have mismatch between total interest declared and the proof provided? Obviously, your employer may ask for proofs (loan statements of prior period). They may also ask for Completion certificate / Possession certificate. Thanks for great notes. I’ve question about NPS declaration. Working in IT Company, and not provided NPS option as declaration option, I’ve seperately open NPS account to invest 50k and avail tax benefit ( Invested 1.5 Lac in PPF , ELSS breaking ). What I understood is my tax will be deducted initially because company won’t take my personal contribution on NPS. When I claim for refund to Income Tax department for NPS contribution then what is steps and procedure to follow ? What document I need to send ? Never claim before and not much families with the process. so your guidance will be appreciated. ELSS / PPF are also your ‘personal contributions’ right. So, it is just that you have to submit your investment proof document of NPS to your employer before the deadline. They will then calculate your tax liability accordingly after considering your investments in NPS too. Else, while filing your ITR, you can include this NPS investment under Section 80c total deduction amount and file your ITR. There is no need to submit any documents (Investment proofs) to the Income Tax Dept. Thanks for the detailed article. I have one query. I have to submit all the investment proof by 15 Jan. But I am in a process to buy a flat in mumbai taking home loan and first I didn’t declare this in April 2015 second, This process might get delayed. My questions are..
if I submit all other investment proof but home loan by 15Jan, Will I be getting tax benefit? When should I show that I have taken home loan for ready to move flat when I will get tax benefit of it? If you get possession Certificate of the house by March end 2016, you can claim tax benefits while filing your Income Tax Return before 31st July, 2016. Kindly read: Importance of PC. Please let me know if I do not submit any of the proof now, I can claim my returns later right? Dear Adarsh..Yes, except for few allowances like medical allowance, LTA etc. Kindly go through the article. If I understand it correctly below is my assumption. please correct me if I am wrong. Suppose I come in 20% tax bracket. And my overall tax on total income(X) is Y.
X+Z and tax would be Y+(20% of Z). So my total income and as well as total tax are getting increased. The only advantage is I don’t need to invest that Z amount in this F.Y. to achieve 1.5lac under 80c. Dear Pradeep..but you can claim the interest re-invested under section 80c. Your understanding is correct. Very good article and appreciate your through knowledge and bringing various provisions/benefits for income tax purpose. Please let know whether prequistie is taxable on expat or not. Dear Sunitha..I am not sure about this one. Just wanted some information on the new pension scheme under section 80CCD . Please let me know how much percentage is extracted from Dearness Allowance for TAX Exemption.Please brief me. And also guide me to know which are components in Salary(CTC) break up Income Tax is Exempted and thier benefits. DA is considered as a part of ‘salary definition’ for various calculations like HRA, Gratuity, Leave encashment etc., There is no specific tax exemption available for DA. CTC is based on a company’s HR policies. I am unable to understand what exactly is your query here?? My question is which are the salary components Tax is excempted.What are their benefits while structing CTC for any senior profile.For say General manager level if his anually ctc is 25lks.So kindly let me what are benefits form Tax excemptions under various components. The salary structure or CTC is based on the company HR policies. Medical allowance, LTA, HRA, Travelling allowance, Conveyance allowance, uniform allowance etc are exempted under Section 10 of ITR act. You may read this article which is available on incometax dept website..Click here. Thank you very much Sreekanth for sharing this content. It very much useful. very good article. Appreciate your efforts in collating this. Very well explained. I have a below query could you please reply. We have a provision to show the interest earned on NSC bonds as investments. What does it mean by? I have NSC bonds since last 3 years, Can the interest be treated as investment in this year under 80c? If show this, will be treated as “income from other sources”? So then my total tax can be increased? What is the pros and cons by showing that? Yes, interest earned on NSC is also exempted under Section 80C. So, you need to submit previous year’s NSC certificate(s). But, this interest is taxable and is added back to your income under the head ‘income from other sources’. Ideally, one should declare this interest income in ITR. my mother is nominee for my father bank deposits, my father passed away recently . The amount that your mother has received is tax-exempt, can disclose it as an Exemption income in ITR. But any taxable income generated on this amount is taxable income, can be shown under the head ‘income from other sources’. Read: FDs/RDs – tax implications. Just for ex ,if a guy is actually getting salary of 5L and has major investments/policies on his father name ,and he is transferring the entire salary amount every month to his father bank account.how can he exempt from taxes . Is there any way? Can he show his father policies as his investment because he is transferring the amount to him..?